On June 1, 1956, all NAACP offices in Alabama were forced to close, as a result of Attorney General John Patterson’s nine-year injunction against the civil rights organization. This left a void in local civil rights leadership and a desperate need for a new group to lead Birmingham’s black community in its campaign to end unfair treatment from whites. Recognizing this need, local black leaders called a mass meeting at Sardis Baptist Church. Approximately 1,000 people attended and created the Alabama Christian Movement for Human Rights. Its mission was to fight for freedom, democracy and first class citizenship for Birmingham blacks. Unlike the NAACP, they vowed to attain their goals through direct action and to test the validity of Jim Crow laws through the courts. 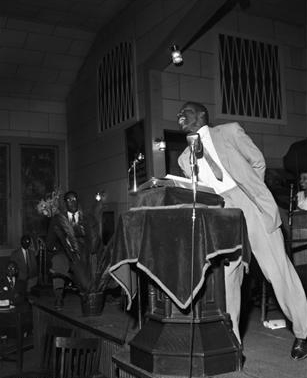 Reverend Fred Shuttlesworth was appointed as president of the ACMHR. He was known for tirelessly pushing reforms for blacks and placing his members and himself in danger to attain them. The group’s goals included hiring black policemen, integrating Birmingham’s public schools, and desegregating all public accommodations. Their initial efforts were unsuccessful. An attempt to enroll black students in an all-white school was met by mob violence, a bus boycott failed due to lack of unity, and gains made in school desegregation led white officials to close facilities rather than integrate them. In 1957, the group became affiliated with the Southern Christian Leadership Conference (SCLC). Together in 1963, they created “Project C,” a month-long campaign involving protests and mass marches led by Shuttlesworth and Rev. Martin Luther King, Jr., then pastor of the Dexter Avenue Baptist Church in Montgomery. The project was met with brutal white opposition, including the use of clubs, dogs, hoses, and enough arrests to overflow the city jail. The project ended on May 10, 1963; one month later President Kennedy announced his plan to desegregate public facilities in Birmingham. On July 2, 1964, President Johnson signed the Civil Rights Act into law. That same night ACMHR members freely entered and enjoyed formerly segregated facilities. Yet racial tensions continued in Alabama—eliciting continued protests, including the famous Selma to Montgomery March in 1965, which provided the impetus for the Voting Rights Act. With the passage of national civil rights and voting rights legislation, community support for the ACMHR and civil rights work began to decline. Though his goal for better police treatment of blacks was still unfulfilled, Shuttlesworth resigned from his position in 1969. Former vice-president Edward Gardner was sworn in as president, although the organization operated in a more modest form. Andrew M. Manis, A Fire You Can’t Put Out: The Civil Rights Life of Birmingham’s Reverend Fred Shuttlesworth (Tuscaloosa: University of Alabama Press, 1999). David J. Garrow, Birmingham, Alabama, 1956-1963: The Black Struggle for Civil Rights (Brooklyn, NY. : Carlson Publishing Inc, 1989).